In the future, the difference between social networks and corporate websites will be hard to distinguish. HP’s social strategist Tony Frosty Welch gestured for me to check out Levi’s recent social moves, his instincts were right, this is unique. Two weeks ago, Facebook announced a crusade in social colonization to spread Facebook across the web, and we’re starting to see Levi’s take advantage of it. 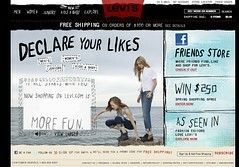 While most brands are only at level 1 of social integration, Levi’s has jumped to level 6 and 7. Education (Above Screenshot): An intro video indicates how users can gesture they like a product, by “liking” it on the Levi’s site –even if they are not logged into Levis.com, you can watch the video also on YouTube. Social Gestures (Above Screenshot): On each product page, Levi’s encourages users to “Like” the products, and uses standard social features from Facebook that prompt viewers to be the “First of your friends” to like it. Social Commerce (Above Screenshot): Using the aggregated Facebook data, Levi’s creates a personalized shopping cart based on what your friends have suggested you’ll like, hoping to increase upsell. 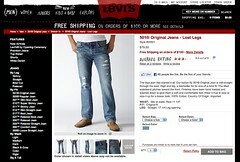 Levi’s has launched a promising marketing opportunity at low cost. By simply installing existing social features into their content management systems, they can increase the mouth of the marketing funnel, and benefit from word of mouth marketing. Your friends are shopping with you –even if they aren’t present. This has two major impacts: 1) Consumers real friends are part of the shopping experience –even if they are not physically present. 2) The level of engagement will eventually cascade to mobile devices in store, so eventually as consumers walk into a retailer that has Levi’s they could scan the product and see which one of their friends likes or recommends it. Consumers take part in marketing and recommendations, increasing upsell opportunity. Levi’s has had social shopping features on their site for some time, you can see the ratings, rankings and comments on each product page, yet in most cases, consumers don’t know who those reviewers are. Edelman’s Trust research indicates that customers trust each other or ‘people like them’ so this has the opportunity to increase. In theory there could be a great chance of up and cross sell as consumers rely on their actual friends to influence buying decisions. Expect celebrities with large followings to be more influential as what they ‘like’ will cascade over thousands. Social commerce vendors will integrate with Social CRM –yet should be cautious of user privacy. Social vendors like Bazaarvoice, Kickapps*, and Pluck and other customer rating tools that occur post login, need to quickly pay attention to this as it’s both a threat an opportunity. They should develop integration tools and integrate their social data with CRM systems (called Social CRM) to create new and unique forms of data that can anticipate customer needs. Facebook users aren’t fully aware of the long term impacts this has, expect some embarrassing and news worthy stories to appear where a consumer ‘likes’ a product resulting in an unexpected result. The biggest opportunities are actually unseen. Expect savvy brands to use demand signals from consumers to indicate which products should be ramped up on production, distribution, and marketing, to learn more read my colleague’s blog on Supply Chain Management, by Altimeter’s Lora Cecere. *An Altimeter client, see disclosure page. We hope you’ll trust our analysis more if we disclose our relationships.